The Trans Pacific Partnership is a secretly negotiated agreement between 12 countries, including the US, Canada and Japan, which establishes punishing regimes for censoring and controlling the Internet, as well as allowing corporations to nullify safety, environmental and labor laws that limit their profits. The corporations and governments that backed TPP dismissed criticism of the secret negotiations process (even members of Congress and Parliaments were not allowed to know about the substance of the negotiations, though corporate lobbyists were), promising that there would be a "debate" after the TPP was finished (that is, when it was too late). Early this morning (US time), representatives of 12 countries gathered in New Zealand to sign TPP. We never got the debate. Now, each of those 12 countries' legislatures will have to ratify the signatures, passing bills that turn the secretly negotiated terms into the law of each land. The US Congress agreed to "fast track" TPP, with even Tea Party stalwarts surrendering their right and responsibility to evaluate the agreement's specifics to the Obama administration's bureaucrats. The fight's not over. This is the largest "trade agreement" in history, and that makes it the most fragile. Politicians will lose their jobs over this, one way or another (though the politicians that back TPP will doubtless walk into cushy industry sinecures in exchange for their willingness to shill). Here's how to join the fight. Of course, the signing is a totally meaningless bit of theater. The real fight is over ratification. The various countries need to ratify the TPP for the agreement to go into effect. Technically, the TPP will enter into force 60 days after all signers ratify it... or, if that doesn't happen, within two years if at least six of the 12 participant countries ratify it and those six countries account for 85% of the combined gross domestic product of the 12 countries. Got that? In short, this means that if the US doesn't ratify it, the TPP is effectively dead. The US needs a majority of both houses of Congress to approve it, similar to a typical bill. And that's no sure thing right now. Unfortunately, that's mainly because a group of our elected officials are upset that the TPP doesn't go far enough in helping big businesses block competition, but it's still worth following. Inevitably, there will be some debate during the ratification process, though there are enough rumors suggesting that no one really wants to do it until after the Presidential election, because people running for President don't want to reveal that they're happy to sell out the public's interest to support a legacy business lobbyist agenda. But, even that debate will likely be fairly limited and almost certainly will avoid the real issues, and real problems, with the TPP. Either way, today's symbolic signing should really be an exclamation point on the near total lack of transparency and debate in this process. The 90 day window was a perfect opportunity to have an actual discussion about what's in the TPP and why there are problems with it, but the administration showed absolutely no interest in doing so. And why should it? It already got the deal it wanted behind closed doors. But, at least it can pretend it used these 90 days to be "transparent." 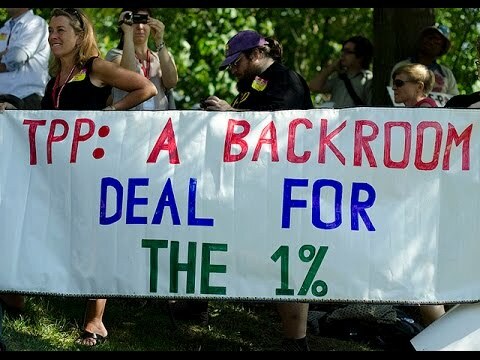 Countries Sign The TPP... Whatever Happened To The 'Debate' We Were Promised Before Signing?